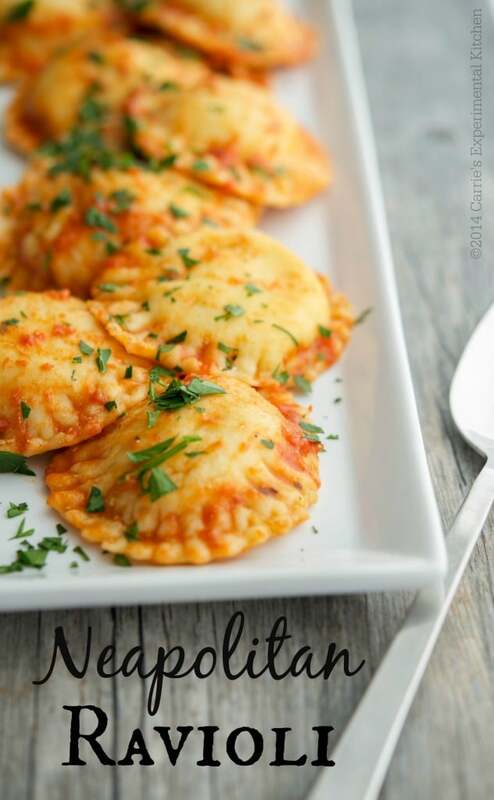 Learn how to make homemade Neapolitan Ravioli. It’s easier than you think and perfect for holidays or Sunday Supper. 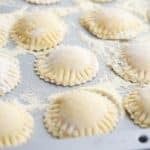 I know you’ve all been waiting patiently for this recipe for Neapolitan Ravioli for years and today is your lucky day. This recipe that has been passed down for generations by my stepmother’s grandmother, Rachael Policastro. From the time I was 10 years old, I remember going to my father and stepmothers home to make homemade ravioli every year for Christmas. It was not just a day of making ravioli, but rather an event with lasting memories. The kitchen was full of energy with each person having their specific job. 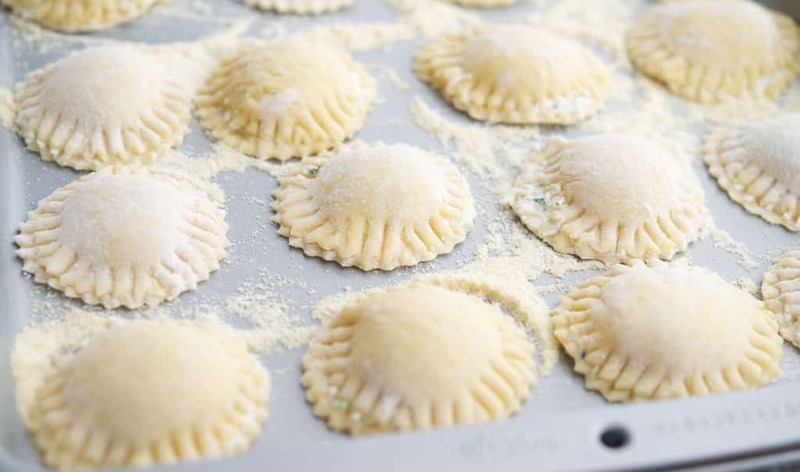 There was making the dough, rolling the dough with a wooden closet rod that had been passed down from generation to generation, making the cheese filling, cutting the circles and stuffing them with the filling, “forking” the ravioli to seal them shut (well this was my term anyway! ), storing them in parchment paper and cornmeal lined shirt boxes to freeze until Christmas day. 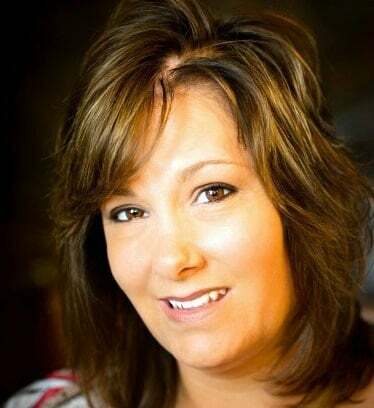 We usually had about 4-6 people in the kitchen as we would make several batches of the dough to have enough to serve as well as give some away to family and friends. To make the dough, start by combining your flour and salt in a large bowl; then form a well to add your eggs, water, and extra virgin olive oil. Mix together using your hands (clean of course!) or you can use the dough hook on your stand mixer. Transfer the dough to a floured surface and knead the dough until it’s slightly elastic and not too sticky. If it is a little sticky gradually add a little flour 1 tbsp. at a time until it’s smooth. Now it’s time to roll out your dough; which is the toughest part for me with my arthritic hands, so this year I enlisted the help of my stand mixer/pasta roller to help thin out the dough enough for me to roll it out a bit more. I also like to use a colored mat when I roll out the dough as the dough should be thin enough to see through, about 1/8″-1/4″. Once it’s thin enough, you need to cut out the circles. We always used a small drinking glass to get uniform sizes, but I used a ravioli cutter I had received over the years as a gift. Next, you want to make the cheese filling which contains ricotta cheese, eggs, mozzarella and Pecorino Romano cheeses, garlic powder and parsley. Place a small dollop of cheese mixture in the center of one of the circles, cover with another circle and “fork” the edges to seal the ravioli shut. Place on parchment paper lined with cornmeal to prevent them from sticking. If you are going to prepare them for consumption the same day, refrigerate until ready to cook. If you plan on serving them on a later date, place them in a container (we used a shirt box and layered them 3-4 rows high using parchment in between layers); then freeze until ready to cook. I know you’re thinking it seems like a lot of work and well, it is. 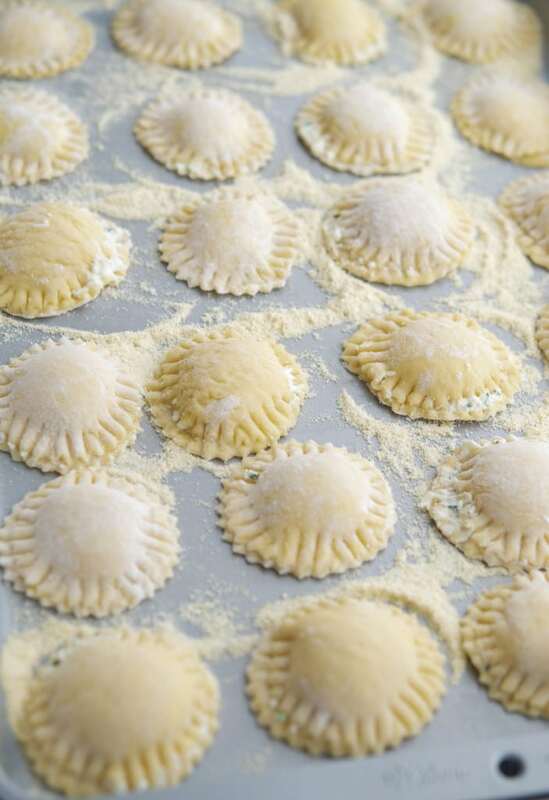 BUT nothing tastes better than fresh, homemade ravioli; which is why we generally only make it for special occasions and holidays. This recipe makes one batch which makes about 2 1/2-3 dozen depending on the size of the glass you use. Top with your favorite sauce like my Neapolitan Ragu, Pumpkin Sage Cream Sauce, Limoncello Asiago Cream Sauce or just some good old-fashioned Brown Butter, Garlic and Basil! Cooking times may vary depending on the thickness of the dough, but a general rule of thumb is they are done 1-2 minutes after they start floating to the top. Combine the flour and salt in a large bowl; then form a well to add your eggs, water and extra virgin olive oil. Mix together using your hands or you can use the dough hook on your stand mixer. Transfer the dough to a floured surface and knead the dough together until it's slightly elastic and not to sticky. 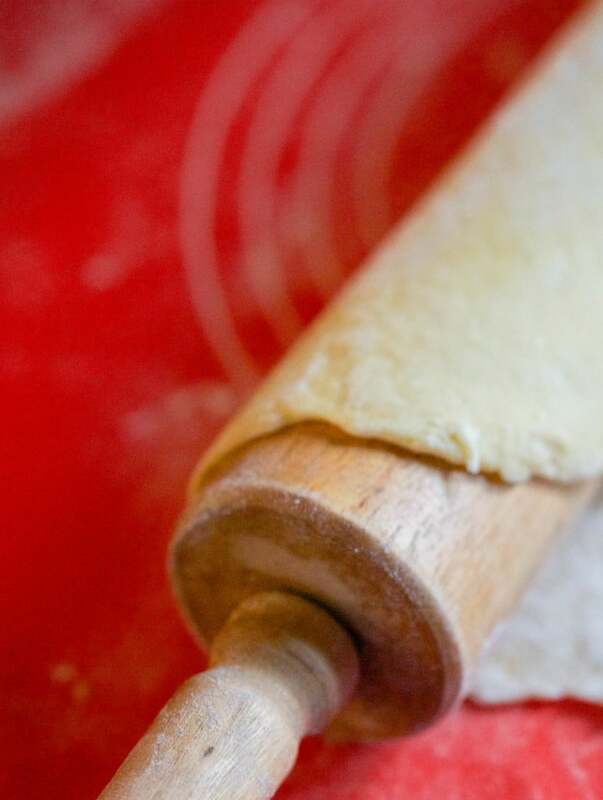 Roll out the dough until it is thin enough to see through; approximately 1/4" thick. Using a small glass, cut out circles (or use a knife for squares if you prefer) to get uniform sizes; then place a small dollop of cheese mixture in the center of one of the circles. Cover with another circle and close the edges of the ravioli and transfer to a parchment paper and corn meal lined sheet pan until ready to cook. Fill a large pot with water and a little salt and bring to a boil. Gently add the ravioli to the water and cook 3-5+ minutes if fresh or 5-7+ minutes if frozen. Tell me what special family traditions you have during the holidays? These look amazing!! I am a pasta addict so these are definitely #onthemenu ! Pinning! Thanks Christie, I’m so glad you stopped by. Enjoy! !